ETAGE PROJECTS presents a group exhibition focusing on the inherent productivity of artistic collusion with three collaboration designs, as well as individual works by FOS, Sabine Marcelis and Guillermo Santoma. Throughout several months, three designers and artists have worked together on the realisation of works by rotating them amongst each other, thus giving up on total control of a process by allowing for interpretation, development and subversion. As a game of Exquisite Corpse materialised into design practice, the project rejects loneliness and solitude and insists on the importance of trust and compassion in any design process – essential themes in the increasingly individualist world of today. 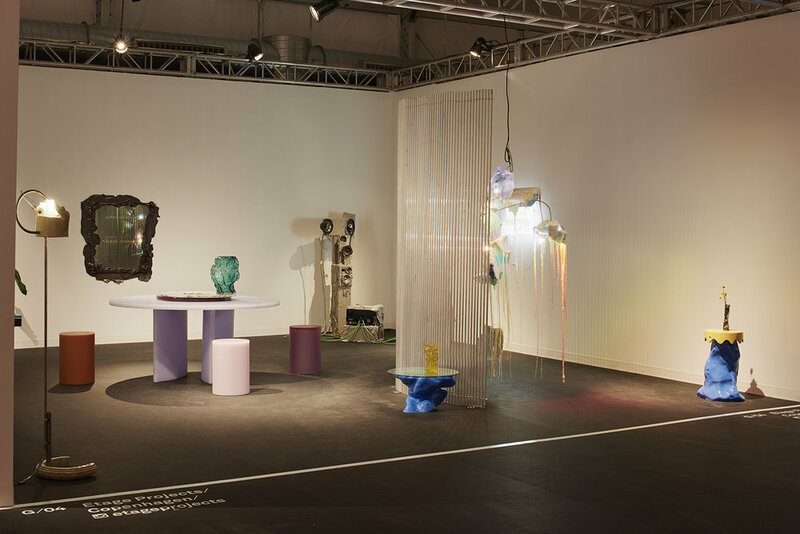 The collaborations are complemented into an interior with solo designs by the same three artists and designers, including a unique and brand new ceramic lamp by FOS, a resin and Italian marble Lazy Susan by Sabine Marcelis and a characteristically contorted speaker set by Guillermo Santoma.